Happy Valentine's Day from the Daily Palette! 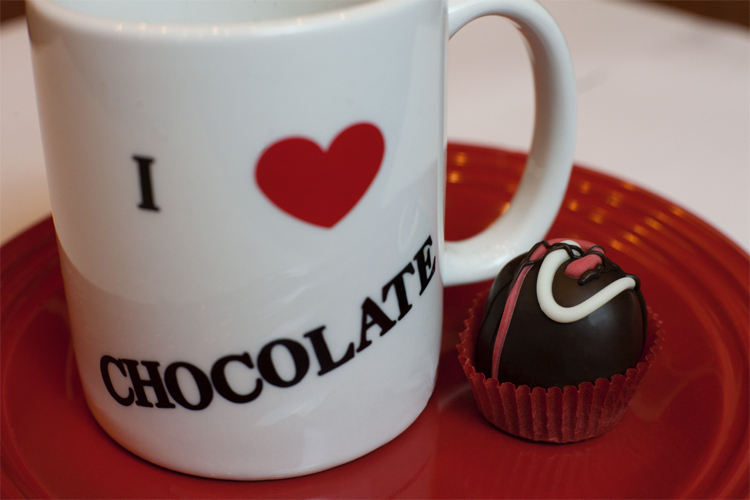 Shortly after Valentine's Day 2004, Gae Sharp Richardson and her husband bought a chocolate shop. The recipe for cooking the creamy insides was delicious but the little chocolate coating on the truffles and creams was boring. It was just chocolate. The customer had no way of knowing what they were getting until they took their first bite. Would this little piece of chocolate be THE dreaded coconut cream? The pained look on their faces took the joy out of selling the chocolate she created. Sometimes, the mystery flavor was revealed by secretively sticking a finger into the bottom of the cream to reveal the coveted raspberry or cherry flavor inside. Discarded coconut creams were left in the box for Aunt Evelyn. She'll eat anything. Gae's goal for her chocolate was to create a different color-coded design for each flavor of truffle or cream so that every bite could be enjoyed without the fear of biting into coconut. A matching "color to flavor code" on top of each piece of chocolate would take the guess work out of choosing your favorite flavor. Red is cherry . . . yellow is lemon . . . The next question is: Can you have your chocolate and eat it too? Gae recently asked the daughter of one of her employees if she would photograph the chocolate for cards. Cora Schlotterback's Valentine cards are available at THE chocolate SHOP in Uptown Marion. So, the answer is YES! Working with chocolate isn't as easy as it looks. It can't be too hot or too cold. Perfecting the tiny raised designs has taken a dozen years. The slightest twist backwards releases the color from the tip of the bottle and leaves a smooth finish to the design. Now, when my customers stand at the case and peer in at our chocolate—I hear them call my chocolate little works of art. And they know what flavor they are getting. That's very satisfying.